Liquid Predator Bait. I took what I believe to be the most attractive meat for both fox, and coyote, and bobcat too! In a special process I liquefy it. Then added a dash of gland, preserved it just the right time and made it freeze proof. Not only does this liquid bait fill the bill as a superior dead of winter bait, it is excellent for the fall and early winter too. 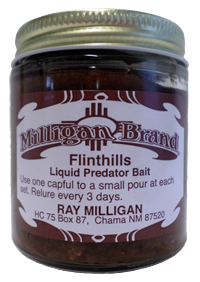 As a bait solution, add 2 ounces to a quart of your own bait to spice it up, for extra appeal. 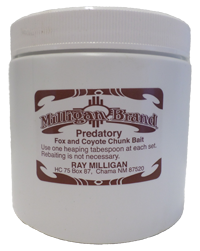 This bobcat meat bait is top dog for fox and coyote men across the country. This sweet solution will offer you a bait with high appeal for eating, also a curiosity element for the canines sweet tooth. Aged to a taint! A big favorite thats back.